Two full time RV’ers eating, seeing, and RVing their way across North America! Hi There! We’re Dennis Smith & Liz Brumer-Smith. 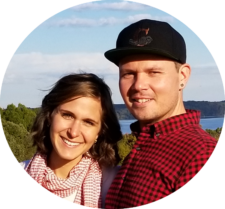 We’re two travel loving, real estate investing foodies that are following our dream of full time travel. After lots of planning and preparing in March of 2017, we sold all of our belongings and moved into our 2017 Fifth Wheel Toy Hauler with our two cats. Now we RV full time, documenting our explorations and sharing all the wonderful lessons, sights, and adventures North America has to offer. We hope to share our story and inspire you to follow your own dreams, because if we can do it, so can you! Join our mailing list to stay up to date with our posts, videos, and get inspired to follow your own travel dreams! Click a pin on the map below to see all the fun we’ve had in the locations we’ve visited!